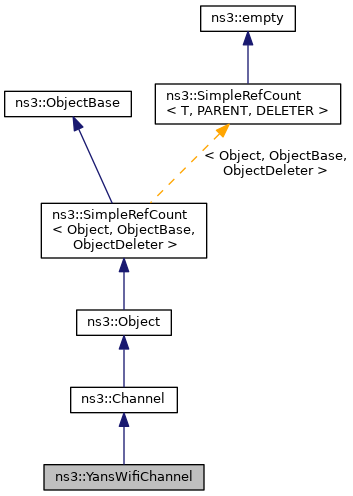 a channel to interconnect ns3::YansWifiPhy objects. This class is expected to be used in tandem with the ns3::YansWifiPhy class and supports an ns3::PropagationLossModel and an ns3::PropagationDelayModel. By default, no propagation models are set; it is the caller's responsibility to set them before using the channel. PropagationLossModel: A pointer to the propagation loss model attached to this channel. PropagationDelayModel: A pointer to the propagation delay model attached to this channel. Id: The id (unique integer) of this Channel. 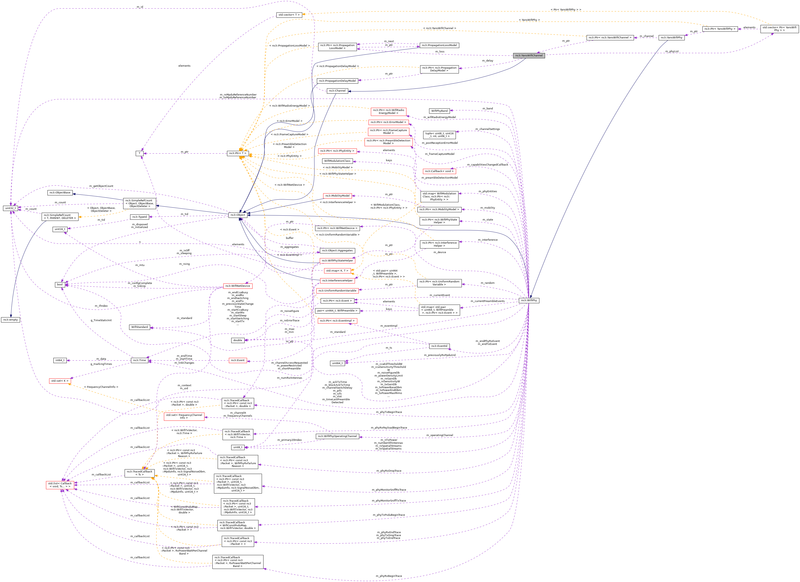 Size of this type is 72 bytes (on a 64-bit architecture). Definition at line 44 of file yans-wifi-channel.h. A vector of pointers to YansWifiPhy. Definition at line 105 of file yans-wifi-channel.h. Definition at line 59 of file yans-wifi-channel.cc. Definition at line 64 of file yans-wifi-channel.cc. Adds the given YansWifiPhy to the PHY list. Definition at line 151 of file yans-wifi-channel.cc. References m_phyList, NS_LOG_FUNCTION, and third::phy. Assign a fixed random variable stream number to the random variables used by this model. Return the number of streams (possibly zero) that have been assigned. Definition at line 158 of file yans-wifi-channel.cc. References ns3::PropagationLossModel::AssignStreams(), m_loss, and NS_LOG_FUNCTION. one of the NetDevices connected to this channel. Definition at line 145 of file yans-wifi-channel.cc. the number of NetDevices connected to this Channel. Definition at line 139 of file yans-wifi-channel.cc. Definition at line 41 of file yans-wifi-channel.cc. References m_delay, m_loss, ns3::MakePointerAccessor(), and ns3::TypeId::SetParent(). This method is scheduled by Send for each associated YansWifiPhy. The method then calls the corresponding YansWifiPhy that the first bit of the packet has arrived. Definition at line 125 of file yans-wifi-channel.cc. References ns3::DbmToW(), ns3::Time::GetSeconds(), NS_LOG_FUNCTION, NS_LOG_INFO, and third::phy. sender the phy object from which the packet is originating. This method should not be invoked by normal users. It is currently invoked only from YansWifiPhy::StartTx. The channel attempts to deliver the packet to all other YansWifiPhy objects on the channel (except for the sender). Definition at line 85 of file yans-wifi-channel.cc. References ns3::PropagationLossModel::CalcRxPower(), ns3::Packet::Copy(), ns3::WifiPhy::GetChannelNumber(), ns3::WifiPhy::GetMobility(), ns3::Object::GetObject(), ns3::Time::GetSeconds(), m_delay, m_loss, m_phyList, NS_ASSERT, NS_LOG_DEBUG, NS_LOG_FUNCTION, Receive(), and ns3::Simulator::ScheduleWithContext(). delay the new propagation delay model. Definition at line 78 of file yans-wifi-channel.cc. loss the new propagation loss model. Definition at line 71 of file yans-wifi-channel.cc. Definition at line 121 of file yans-wifi-channel.h. Referenced by GetTypeId(), Send(), and SetPropagationDelayModel(). Definition at line 120 of file yans-wifi-channel.h. Referenced by AssignStreams(), GetTypeId(), Send(), and SetPropagationLossModel(). List of YansWifiPhys connected to this YansWifiChannel. Definition at line 119 of file yans-wifi-channel.h. Referenced by Add(), GetDevice(), GetNDevices(), Send(), and ~YansWifiChannel().